Mary had a very distinctive way of talking. She extended her vowels, drawing them out almost to the point of a drawl, and prefacing most of her sentences with, 'Oh'. As a result, she would often address us with, 'Oh, Lahhhnce, oh, Jayyyne......'. We delighted in it, as she delighted in life. Although she died almost exactly four years ago, and we miss her dreadfully, we feel most fortunate to have counted her amongst our closest friends. Originally secretary to T.S. Eliot, the Anglicised American poet and playwright, most famous for 'The Waste Land' and 'Murder in the Cathedral', Mary had married David Bland, a director of the publishing house, Faber & Faber, who, at the time, was its commissioning Art Editor. So it was that Mary moved in the most literary of circles, including among her friends poets, such as John Betjeman and Anne Ridler, and the painter John Piper whose work hung in her home. Following the early death of David, Mary established a successful business selling second hand gardening books from a shop in Mortlake Terrace, on Kew Green, London. The shop continues to this day. From there she entered the milieu of the gardening cognoscenti, for years taking a stand at the Chelsea Flower Show for the sale of her antique and rare gardening books. Often we would join her for a preview of the show on Press Day before its opening to the public. Later she gave up Chelsea, critical of the designers who, latterly, with notable exceptions, she viewed as untalented, and the awards handed out for mediocrity, as well as the growing presence of non gardeners obsessed with celebrity status. All of which, regrettably, remains unchanged. But Mary never spoke with rancour. And in all the many years of our friendship only once did she proffer advice against the developing acquaintanceship with a young person who, uncharacteristically, she regarded as devious. But it is through Mary's deep knowledge of gardening and her love of books related to that subject that we have, over time, built up our own gardening library, concentrating mainly on first editions dating from the late nineteenth century up to the present day. Today Mary's remarkable and informative catalogues, stemming from the mail order business of her later, retirement years, no longer, alas, drop through the letter box. They, but much more so she, are truly and sadly missed. A very lovingly written tribute to your dear friend. I am sure she would have loved your blog. So, the woman with the black beads. She looks quite unassuming. What an interesting sounding lady. Keen gardeners so often are interesting. I expect you've seen the exhibition at Gt Dixter. I absolutely love your bookcase by the way! It is good to have vivid memories of special friends, particularly if they are as engaging as your friend Mary Bland. Perhaps Chelsea might be allowed to borrow Mary's surname; it would fit this annual circus so much better. Does having bookcases full of gardening books long after you've cleaned the trowel for the last time and put away the trug bring back the delights of gardening or make you sad at having given them up? I cannot imagine either of you pottering about on a balcony. WOW, Jane and Lance, and hello. I have been a huge T. S. Eliot fan. His influence has been in my hearing and feeling nearly 40 years...I attended Melbourne Grammar School - where I started to post my poetry on a school notice-board... and where I was encouraged by very enlightened teachers to write. The funny thing is, friends of my family were Blands, and one of them taught at my school, and another, his nephew, was a close friend of mine ( now a forester ). 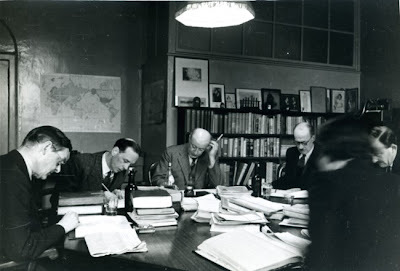 Faber and Faber is/has been one of the world's truly great publishing houses. I am sorry you have lost a very dear friend, but I hope your obviously stunning collection of books ( can we see more of them, please? ) will serve as a reminder of the things that matter...among them, friendship. We are quite sure that Mary would have loved to navigate the blogosphere. An avid reader with a keen sense of fun, we are certain that she would have so enjoyed reading the many tales written from all corners of the world. Yes, the woman in the black beads. We always think that those who appear unassuming are usually the ones to watch out for in every respect! She sounded like a fun and fascinating individual. This is a lovely tribute. What an amazing life Mary led. She must have been a delight. I too am a T.S. 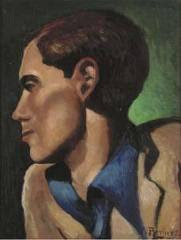 Eliot fan, and can't imagine how fascinating it must have been to have known someone so intimately connected with him. Great story. What a lovely tribute to your friend Mary. I observed that you have all the top gardening names in your bookcase, but alas I could not see your own books? We must confess that Great Dixter has never been a favourite of ours, although we much enjoyed over many years Christopher Lloyd's column in Country Life and we have many of his gardening titles. Our bookcase, inherited from an uncle, holds many of our gardening books but, sadly, not all. And so, yet others are stacked on tables, chairs and shelves elsewhere! I am very sorry for your loss, though it has been a number of years. I doubt these pangs ever truly lessen. This makes me quite love and admire her, all on its own. And Jane, you sly thing, with your back to the camera. :) It has been odd for me to form such genuine affection for one whose face I have never seen. Oh yes, the Chelsea Blandwagon, how it rolls out ever more tediously with each year that passes! We did consider selling our gardening books and filling up the bookshelves with a new collection. However, they represent such a large part of our past life and hold such dear memories that probably they will be with us for ever. But, no, they do not make us sad, far from it! And, we are rarely to be seen gardening on the balcony as we only have six plants to look after! We agree with you that T.S. Eliot is one of the finest of C20 poets and so are not surprisd to read that you have been influenced by his work. We were intrigued to note that he once remarked, "My mind may be American but my heart is British". This is but a part of the gardening book collection that we have and, no doubt, others will find their ways into blog posts of the future. Click to enlarge the image and have a close look! Most definitely! A life well lived and full of interesting people, she remains a role model for us. Yes, we understand that Mary's time at Faber and Faber was always full of interest. It was a most prestigious publishing house and so the most talented individuals of the day were part of her daily work. A charmed life indeed and, as you say, so very fortunate to have known T.S. Eliot as a friend. What a full and interesting life your dear friend Mary must have had, mixing with such interesting people.....and then to go on to have a bookshop that still remains, must be a fitting legacy for such a woman.I hope that it remains open for many, many years to come. Your post is such a lovely tribute to a cherished friend. How generous of you to have been looking for them! Mini versions of some of our titles are 'lurking' on the second shelf down on the right hand side of the middle of the bookcase. 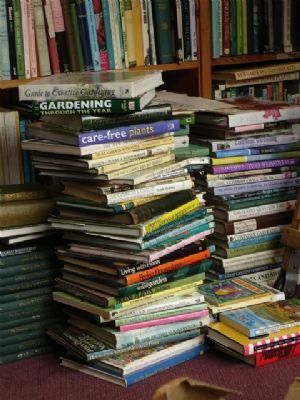 But, as with many other of our gardening books, they are also stacked and scattered all through the apartment. You are so right that it so often the tiny details...the intonation of a voice, a particular smile, the way in which the head is held....that are the most powerful memories of people one has known and loved. And, indeed, it is also true that just the smallest trigger can bring these thoughts flooding back and, with them, emotions too. However, for us, we feel that to talk about people who have died keeps them alive and with one still. Yes, we are sure that you would have loved Mary too. Always full of the most amazing stories, a sharp wit, a raucous laugh, a good cook [always significant for us!!] and a warm and generous heart. Well, Suze, you may be sad to know that the back view does not reveal very much as the hair colour has changed significantly since that day some six years ago!! However, our hearts always lift when that sunny face, complete with shiny specs appears on our blog. Miles may separate us but our thoughts are as one. Faisal, you need never be hungry in Hungary! We should be delighted to entertain you and to let you roam through the shelves, rummage through the stacks, peruse the piles, trawl the bookcases.....and even read one or two!!! And I quite envy Mary's friendship with the man who measured out his life in coffee spoons. If you ever find yourself near Kew Green, you may wish to seek out the bookshop as it still carries an impressive range of gardening titles. And, how well you put the case for Chelsea. It is, as you say, so important for gardening, as all other art forms, to move forward and develop. We are sure that you have the right spirit about it all and it certainly does not seem to wane in popularity if the crowds are anything to go by. What an affectionate and perceptive tribute, Jane and Lance. She sounds a friend to treasure, both in memory and through the books she enabled you to collect. May she rest in peace. I don't know Mary Bland's name. But I do know how difficult it is to write interesting gardening books that attract and hold the attention of amateurs. It is much easier to write fascinating books, I think, about architecture or jewellery or furniture. She must have been a gifted writer. Oh yes, how often we have thought that we should have loved to have known T.S. Eliot as Mary did. "Do I dare/ Disturb the universe?/In a minute there is time/ For decisions and revisions which a minute will reverse". Perhaps one day we shall all disturb the universe together!! What a beautiful tribute... and legacy. Mary did, in fact have a strong Christian faith which did sustain her through the very difficult and painful years which preceded her death. Never one to complain and always prepared to see the 'good' in people and situations, she was a most inspiring person to have known. A lovely post about a close and very interesting friend. And how I love the photo of your bookcase! Even though I'm not a keen gardener, these books certainly made my mouth water - and I love the comments from Gardener in the Distance! Perhaps we have written rather confusingly. Mary herself was not a writer but she did spend all of her life with literary people and for many years dealt in second hand gardening books. It is through this, when we gardened in Herefordshire, that we came to know her and our friendship developed. You may be interested in David Bland's,her husband's 'classic' book, 'The Illustration of Books'. Mary was a marvellous person and through her we came to know a great number of interesting and artistic people. I so desperately need gardening books; my knowledge of garden plants is dismal. However, I am quite happy in my ignorance, and will continue to learn more and more about my beloved fruit and vegetables instead. My garden philosophy is that if it doesn't produce something edible, then it doesn't get planted. There are one or two exceptions, of course! We are so pleased that you have enjoyed looking at the gardening books. Whether one gardens or not, they are extremely seductive often with such lyrical writing, tempting plants and wonderful photographs. We once toyed with the idea of a poison garden, but finally relented and made it a more user friendly 'Gothic Garden' instead. Can you really garden without a peony or a single rose? Can you? We are already detecting a weakening of position! I find remembering dearly departed friends, recalling those momemts spent together are difficult but joyous also. We miss them so, but they are always in our hearts and are part of our being. They are in the story of our lives. You wrote beautifully (as usual) of Mary Bland. Being a very amateur gardener, I have books and magazines stacked high on plants and flowers. Mary's passion and love of gardening and books was about making life more lovely. I can see that she is remembered with much love and admiration. Interesting. I have just prepared my post for Sunday evening and find it somewhat linked to the passage you have quoted. To answer his question, which to this day resounds: I DARE. Have a beautiful weekend, my admired fairy godparents. Arleen, how wonderfully you capture the joy and melancholy attached to remembering those friendsone has known andloved. Mary is indeed, written into the story of our lives. And yes, can one ever have too many or tire of gardening books? Somehow, there is always something new and different to learn from them but finding room for them all is becoming increasingly problematic for us! Did ever Sunday evening [or it could well be Monday morning] look so interesting? NEVER!! We love a dare!!! Go, fairy godchild, GO!!!!! Yes, life was not easy for Mary when her husband died leaving her with two children to bring up on her own. She was incredibly strong, enterprising and warm-hearted. A winning combination. "....the growing presence of non gardeners obsessed with celebrity status..." Yes. She was right to feel that way. And it could be said of designers too - and artists. Ooh and singers! There is far too much emphasis placed on fame and celebrity status and not enough on actual talent. It's all a bit depressing. I'll say it again. You've been blessed to have known some very interesting people. Nicely written. Have a nice weekend! So many,many times have we said something similar to what you write here. It seems so unfair that people with marvellous talent go unnoticed in favour of more flashy indiviuals with the 'right' connections. C'est la vie! Thank you and we hope that your weekend is enjoyable too!! How lovely to read the tribute to your dear friend. I count our books as some of our greatest treasures. Your bookshelf looks wonderful. A collection of interesting books and interesting friends - a good life indeed. We could not agree more. Books and friends are two of life's greatest pleasures and treasures and to be separated from them is such a sadness. We rarely give away our books, even paperbacks, hence we have them everywhere. Our latest 'design idea' is to use small books as plinths for raising up small ornaments! What a beautiful post and tribute to a dear friend this is. An interesting friend too. It must be a delight to make your job out of books and plants! Your cupboard with gardening books looks huge. I hope you will share some images with us one day. Those old gardening books can be so pretty! Thank you for your comment on my Paris post. It was the first time we used a walk from a book, but we enjoyed it very much. You get to see much more and it is far less tiring than just walking criss cross through the city. She was a most interesting and, as you may well imagine, very well read woman. Through her we met some fascinating people within the gardening and publishing worlds, many of whom became and still are close friends. Walking is the perfect way to see a city we feel as the pace enables one to really absorb the detail and the atmosphere. However, there is always the temptation to cover too much ground and then foot massages are in order!! We hope that you are enjoying a happy weekend! Well, what a fascinating thought. It is certainly a very real possibility that PB could have known her and perhaps visited her bookshop. When later Mary 'retired' to her house near Presteigne she was also very well known throughout Hay on Wye which, as we are sure you know, is a 'Book Town' on the Welsh Border, home to the annual Hay Literary Festival. A lovely post ! She sound most interesting and someone I would have loved to sit down with and chat with about gardening. Your gardening library is amazing. Yes, Mary was a very interesting person and incredibly knowledgeable about all matters gardening. Perhaps if you are interested in gardening and ever find yourself near Kew Green, you could visit the bookshop she once owned since it is a horticultural treasure trove. We really wish that we had kept all Mary's catalogues since they were a veritable who's who of gardening over the years and really reflected the changing styles, names and fashions of the gardening world. What an interesting life have you got! It is always refreshing to follow your blog. Thank you. And how marvellous that we can enjoy the wonderful sand and sea from the comfort of our own drawing room via your delightful blog! Mary sounds like a fascinating woman and I greatly enjoyed your tribute to her. I would like to visit that book shop. I feel for the loss of your friend dearly... Isn't it so very sad when we experience someone so dear to us leave? I adore the collection of books you have gathered, shows real interest, dedication and the love through the friendship that you valued so dearly. Dear Lance and Jane, what a very beautiful tribute to your sadly missed friend. I found your post so very interesting, as usual but also insightful of the meaning of true friendship. I hope your precious gardening book collection continues to remind you of fond memories of Mary. Hello Jane and Lance - I can't claim to be a gardener by any means, but my father created fine gardens, and I've kept his The Wise Garden Encyclopedia. Perhaps that is part of your collection. What a wonderful tribute to your friend. It sounds like she had a fascinating personality and led an extraordinary life. I am sure she is greatly missed. Thank you for sharing this story! Dare I suspect that Mrs. Bland due to her close associations with the literary and artistic minded navigated life in gossamer cloud of enlightenment? And perhaps a most sought after conversation companion? This being derived from the wonderful picture you have posted were her two immediate table partners are intently leaning in for the conversation. As well as the expression of total attention given the current speaker. How wonderful for you both to have been able to count Mrs. Bland as a close friend, the hours spent in dialogue must have been greatly entertaining. Yes, Deborah, Mary was an extraordinarily kind and generous person and also one who was exceedingly knowledgeable about many things besides books and gardening. 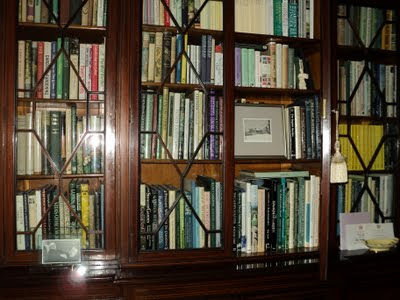 How kind of you to be so generous about our gardening book collection which, sadly, overflows into other bookcases, onto shelves as well as being piled on tables and chairs. We feel very honoured, and flattered, that you should have a) discovered that we have written some gardening books and, b), that you have ordered a couple. We shall be intrigued to know which titles and do hope that you will find them of interest. We do, of course, continue to miss Mary very much for she was such a good friend and always excellent company. And it was through her that we came to learn so much about old books, and gardening ones in particular, and started our own collection. Thank you so much for your very kind comment. Mary was a very generous, kind and loyal friend and one who led a most interesting life. But, as you say, we do have a constant reminder of her through our gardening books and it was very much she who helped us to build the collection. We can no longer ourselves claim to be gardeners and, having gardened seriously for over twenty-five years, are now rather pleased not to carry on. No, we do not know of 'The Wise Garden Encyclopedia' but will certainly look it up. She sounds like a remarkable and lovely lady. Your photo of her shows her to look very friendly too. Although sad that you lost her, how lucky you are to have known and befriended her and to have memories of her which will last you a life time. Mary was, indeed, an inspirational person. And even in her last years, when beset with illness, she continued to live life to the full. And we have so many reminders of her, not least the books. Now we shall be very wary of publishing any of our own pictures in future for, doubtless, with your photographic skills you are not merely 'clicking' to enlarge the image but are also, at the same time, analysing them in detail both for content and quality!!! Mary was, as you imagine, a great conversationalist but one who never, for herself, sought the limelight. In fact she could be quite self effacing at times. Also she had that rare gift of one who listens. Yes, it is, as you correctly observe, Jane's back but not, in this case, Lance's hands. As there were about fifty of our friends on that occasion, we were seated at several different tables and we each headed one so we were not together. Finally, dear Gary, an apology about the quality of the images. The one showing Mary is, as you will have seen, a rather poor photograph of a photograph taken at night! Mary was, as you will imagine, a remarkable person who was always excellent company in any situation. She had both a lively and enquiring mind as well as a great sense of humour. We remember her with much love and affection. Rip your dear friend Mary, and I hope that there will be someone to remember me as fondly when I am gone. In our book you could never be too late for any party and, where this one is concerned, you are more than welcome as always. Besides, we intend to keep it going for several days yet, being the lazy tarts we really are. Yes, we should all hope in time to be remembered fondly. Gosh that's some selection of gardening books! What an interesting tribute to your friend. I came here to say that some people leave such a hole when they die and ended up smiling at your reference to yourselves being "lazy tarts"! Hope you are having a wonderful Sunday. They were for a long time a great interest of ours. Shown here is only a part of the collection. And, yes, Mary was a most interesting and entertaining friend. We are and we are! That is to say, lazy tarts and having a really good Sunday, as we hope that you are too. And we are glad that it made you smile. Did I thank you for becoming a follower? I think not, so thank you. I am about to reciprocate. I can see I need to allow time to read and re visit the comments but also to get into 'the groove'. We are as delighted to welcome you as a Follower as we are to have discovered your own most interesting 'Bun Mountain Cottage' to which we shall much look forward to returning. Have a very happy Sunday. This is such a beautiful tribute to your friend and obviously a great woman. Wonderful piece of history too. I can't say i am a gardener but i love my flowers and even try to plant a seed or two every spring. Yes, thank you, Mary was a remarkable woman and did much to enrich our lives. You say you are not a gardener, but anyone with an interest in Derek Jarman and his garden is, perhaps, not only a little appreciative of plants but also gardens as an art form. Nice tribute to a your friend and gosh what a full book case on gardening you have there. I only managed to grow three cauliflowers this year, not bad I guess considering I've only started growing things this year. I'm so not convinced it's for me, it's all stooping down getting a bad back, or kneeling and getting achy knees and I wont even go on about muddy fingers. Lovely shine on your book case too, a secret polish? a decent wax? There is certainly a huge amount of hard manual labour attached to gardening, but to have produced a decent cauliflower is no bad thing. They are, in our view, quite tricky to grow. Just regular polishing is all the bookcase gets although every so often the 'Lord Sheraton' beeswax comes out which serves to clean as it shines! Mary sounds like a fascinating lady, and it must have been a memorable dinner party! Yes, Mary was fascinating and was enormous fun to be with. The dinner was the occasion of our silver wedding anniversary and was very memorable indeed. Multiplying or not, we are rapidly running out of space for our ever increasing book collection! I consider myself fashionably late to the party. I too hope that I am remembered as fondly. Dear, dear Lulu, you would be fashionable whatever your time of arrival. And, the party has just begun, the night is yet young and the champagne is on ice...an evening to remember and be nostalgic,perhaps!! Eons ago, back in my college days, I memorized large portions of "The Love Song of J. Alfred Prufrock." It seemed like a good idea at the time and my mind was eager. Your friendship with Mary must have been fascinating. Old gardening books are often filled with such beautiful illustrations. I think I could get into collecting them. I've been looking for something new to collect and books are always a good bet. I'm very grateful to have met your acquaintance. You broaden my horizons in some very intriguing ways. Yes, thinking back, we too can remember learning by heart so many things but nothing quite as uplifting as T. S. Eliot's poetry, sadly. Old gardening books are indeed interesting. Some have wonderful illustrations, some contain excellent advice but, perhaps best of all, some have the real spirit of the maverick gardener in their quest for the 'perfect' plot! Thank you for your most generous comment. We always find your posts thought provoking and carefully considered, reflective, we are sure of your lively and enquiring mind. What a fascinating life your friend Mary had! Wow--to have been secretary to T.S. Eliot! I especially love your party table picture...what an intelligent looking bunch of people! For some reason, they look so familiar to me. It looks like it could have been taken in New York (I used to live there)! Your description of Mary's distinctive way of talking reminded me of a relative of ours whose speech employed those same drawn out patterns. He, too, was a literary-type (American author Louis Auchincloss). It was always fun to listen to him talk--he sounded so patrician (but, then again, he was). As for your collection of gardening books, I will be sure and email you if I have a question about gardening--since it looks as though you have all the answers at your finger tips! Thanks for sharing this tribute to your friend. A lovely personal tribute to your friend Jane. She certainly had a very special place in your lives. What a collection of gardening books! I'm interested to know whether Mary proved to be right about your young friend? Although, on reflection, perhaps I have dared to step across the mark ..... and a reply is unnecessary. The party was indeed wonderful and we were so pleased that Mary could be there as she had not been feeling well at the time. 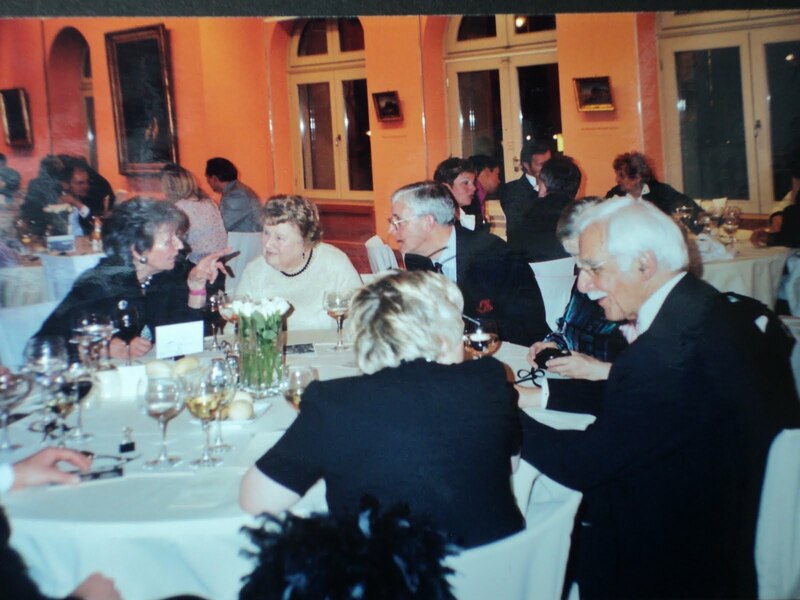 It was the occasion of our silver wedding anniversary and some 50 or so friends had travelled to Budapest to join us. Yes, a gardening book for every possible situation and to answer every question, we must have it somewhere!!! We have noted with interest your relative, Louis Auchincloss, such an interesting name, we shall investigate him further. Cheers to the memory of your dear friend, and for allowing her to live on through your loving memories. Thank you for introducing us to this wonderful spirit. Mary was, as we find ourselves often remarking and remembering, a very special person in our lives. We miss her greatly, not least for her very real sense of fun and love of life. Thank you. Mary was, as you suggest, an exceptionally good friend and, of course, a mine of information when it came to our forming a collection of gardening books. Such friends are not found lightly. What a nice way to remember your friend...she must have been very special and such a wonderful career. I think that all gardeners and people that are interested in gardening have a special link. Your collection of books is grand, it makes one yearn to open up the cabinet and enjoy! We do so agree with you about people who garden, or who are interested in gardens, having something of a special quality which binds them together. Even though we no longer have a garden, we continue to enjoy the books. Well, of course, we have only just heard the joke of 'Blandtation' but it certainly made us laugh! Yes, penned sounds so much better than 'typed' although, sadly, truth be told that it is some time since we picked up our fountain pens and put them to paper. Composing the words on a computer screen is just not the same and, regrettably, nowhere near as satisfying. Thank you for your kind words. We hope that you have a happy week ahead! Let's hear it for the humble weed, a plant whose morals have yet to be discovered. I would be delighted to see a weed garden at the Chelsea Flower Show, hanging baskets full of dandelions and trailing buttercups, a box hedge of thistles. Cut red roses look superb in a glass vase with hemlock much nicer and more readily available than gypsophilia. Many weeds have medicinal properties too, when did you last hear anyone being cured from a rose bush. It's one of life's great pleasures to be introduced to a new passion - especially when combined with an enriching friendship. Your vignette of Mary clearly shows her to be a more evolved soul than I, however - I often take a wicked delight in speaking with rancour!! We really believe that you are on to something BIG here, dear Mitzi. Never mind the lure of a medal, what would one do with that anyway, the aim would be to surprise, shock even those oh too staid judges who only wish to reawrd those 'Gardens of a Golden Afternoon'!! Mary had that excellent balance of being able to totally speak her mind without ever sounding unreasonable. Quite an art. We, too, have yet to perfect it! I do completely agree with your late friend's criticism of the "slebs" who design gardens for Chelsea, (or indeed do anything for which they have no qualification). And obviously being a "sleb" isn't one. 'Sleb' how we love that word and the only qualification necessary is to be a 'sleb' or, worse still, to have climbed the slippery 'sleb' ladder through knowing a 'sleb'. This year's Chelsea seemed to be particularly full of 'slebs' and in so many guises ...... wannabe 'slebs', has-been 'slebs', B movie 'slebs', outdoor room 'slebs',décor 'slebs' .........'slebs' by name and 'slebs' by nature in our view!! Hello Jane and Lance. This is a heartfelt tribute to your loved friend. I believe whenever you think of Mary, she is transferred from heaven through your consciousness and is near you. Friendship can’t be measured by material things, however, I can see how you two and Mary were connected deeply by your large collection of gardening book. I understand Mary was inspiring and had special quality unlike her name. I wonder what would be remembered about me after my death. To know this wonderful friendship, I’ve become curious about what you two have been doing. Wish you happy days ahead. My comment sent last evening must have been confiscated by Mary or some cyber space Ghooost! Mary's face speaks of kindness, intelligence and one can see she cares by listening (like you said a rare quality). Mary Bland re-invented herself as life evolved and grew and planted seeds of joy, hope and love. If she were a flower, what do you think she would be? My heart pounded on seeing your father's bookcase and how beautifully arranged are those shelves with artifacts interspersed carefully beside the books. Seeing a library like these makes me dream of being on holiday in this room for one week, all alone just reading and sipping tea. Mary, too, was blessed to have known you Jannnnnee and Lannnnnnncee! "requiescat in pace Maria"
Thank you for bringing to life memories of a special woman. We agree absolutely that in remembering and talking about people who are dead one really does bring them 'to life' and can relive the time spent together. In this way they never do, in our view, really die. And yes, how right you are that friendship cannot be 'measured by material things'. However,the building of our gardening book collection was so intimately involved with Mary's life and work, her gardening knowledge, her many gardening and literary friends that they, inevitably, are a powerful reminder to us of a dear friend and a friendship that we shall always cherish. We are so sorry that your previous comment disappeared without trace. It does seem to be that Blogger or some other hungry ghost is consuming them left, right and centre. We have lost many!! Our fist thought of Mary as a flower would be to liken her to Hydrangea 'Annabelle'. Generous with her flowers, robust in habit, elegantly dressed, suffers in the heat but is quick to respond to a drink,combines well with other plants in the mixed border, a long flowering season and even dying gracefully. Yes, that would seem to be appropriate and Mary would have liked the fact, we think, that it is not widely grown and can be quite tricky to track down!! As for holidaying in our drawing room....the invitation is an open one! A moving tribute to your friend...with so many strands to follow. My gardening books are still in France - and i miss them! I am always astounded at how lucky you are, and what amazing people you have encountered throughout your lives. I am so glad that we have found each other in the blogosphere, and I can read your recollections of your wonderful friends. Wow! Great story:) Where do you get all this spectacular info? We are, of course, delighted to have your comment. In recent weeks we too have been experiencing on going problems with Blogger - something which now seems part of daily life! We are so sorry that you are currently parted from your gardening books. We are similarly placed during the times which we spend in Brighton. Not a happy arrangement! Strangely, we never really think of it other than to feel that we are so very fortunate to have so many very good and loyal friends, all of whom, for many different reasons, we find most interesting. But, Olga, where the blog is concerned, it is we who are so glad to have found you. We think of you first as a friend, but also as a very gifted, creative and talented artist, as well as a person in your own right. A view shared, we are certain, by your many, many Followers. And one day we shall meet for real! Thank you so much. You are more than generous. But to answer your question, then it is simply from living life where we are fortunate to have met, and made friends with, so many very interesting and lively people. My goodness your blog always get so many comment and I am so late this time. What a lovely post on what sounds like such an interesting life your friend had. Book and gardening, perfect. There is no time schedule here and no train to catch! We cherish each and every comment we receive and love the dialogue with our commentaters. Yes, Mary did have a most interesting life and it was wonderful to be part of it. The gardening world is full of 'characters' and so was never dull. Good friends are hard to come by and their loss felt more keenly when they are gone. Lovely legacy to leave behind...the bookshop and am sure her life has touched more than she could ever know or realize. What a wonderful thought that is..... to touch the lives of so many without possibly even knowing. Mary had such a quiet, unassuming and yet altogether disarming quality that we are sure this statement is so very true in her regard. How lovely to hear from you whilst we are separated by mere streets rather than countless miles. We are so looking forward to meeting tomorrow! What a treasure of a person you got to know and hold as a dear friend. Very fortunate. Thank you for sharing her with us. A treasure, exactly how Mary was. We feel privileged to have been counted amongst her friends. How wonderful to have had such a dear friend to share your beloved passion for gardening with. I wonder, did Mary ever grace the table at your enchanted tower garden and get to enjoy that lovely place? If not, it sounds as if she would have loved it immensely. This is a very touching tribute to her. My gardening books have been packed away these past five years and I miss them very much...I love them just as much as my cooking books! Your collection is very desirous and obviously very special. One can do amazing things with pots these days you know... hanging and otherwise! Thank you so much. Yes, Mary was a very special person who gave so much of herself to so many people. How really kind of you to remember the Tower, Jessica. And yes, Mary was a frequently with us for dinner parties under the Tower, in the dining room of the house and also, on occasions, in The Jerusalem [which is a whole story in itself!]. We are sad that you are parted from your gardening books at the moment and do hope that it will not be for too much longer. Whatever, you will have fun deciding where they are to go. And thank you for your most encouraging words about gardening in pots!! We shall see what we can come up with! Jayyyne, Lahhhnce, Your Mary reminds me of such a fond friend who speaks as eloquently. How lovely to have such a dear friend as Mary. Her love of gardening is astounding, as is your library. I, too, have such a love but not near the library. Such friends stay with us forever. What a lovely tribute to your dear friend. It sounds as though she had a wonderful life - difficult to think of many things better than spending a lifetime surrounded by books! I'm really enjoying your blog. It is full of such beautiful riches, informative and a real pleasure to read. Yes, Sihirli, you have spotted the right woman, but the hair colour has changed many times since then! And yes, we agree that to have enjoyed the real friendship of so many people is one of life's greatest treasures and Mary was richly blessed in that respect. It is strange isn't it what little traits we all have that perhaps we do not notice but others fondly remember us by. Gardening was a passion which we shared with Mary, together with a love of literature in so many forms. Hence, our gardening books serve as a wonderful reminder of happy times spent together. As you say, absolutely a dream to have a wonderful circle of literary friends and to have spent a lifetime in the world of gardening. We loved being part of it. Thank you so much, Sophie, for your most kind and generous words. We are really touched as they come from someone whose own writing we admire enormously. That's very kind of you and I really appreciate it - I'm equally touched. Thank you! Mary sounds like a fabulous, life enhancing person to have had as a friend. I thought I had read quite a few gardening books but looking at your collection, it seems I have only just begun! I recently bought an oldish gardening book by Violet Stevenson in a charity shop and am delighted with it, she was advocating gardening for conservation using native plants in 1985. You were fortunate to know one another and call each other "friend". It is truly a wonderful thing when a person can touch your life and live in your heart forever. As for your gardening book collection, I would love to have at least a quarter of what you have in your bookcase...especially the ones of the early 20th century. Simply a fabulous collection. Good for you! Thank you too for taking the trouble to reply. It is entirely meant. It is so true that when one looks back into early gardening books so many so called 'modern' ideas have been written about and practised many decades earlier. A bok we think you would probably enjoy, published by Faber in 1966 is 'The Wild Garden' by Judith Berrisford. It is both informative and highly readable. That is some amazing collection of gardening books. I love old books and collect the classics in the earliest editions I can find. It looks like you have some wonderful treasures in your bookcase. Good friends are, as you say, so life enhancing and do live on in both one's heart and one's actions long after their death. Knowing your love of all things from the late C19 to early C20, and if you were considering adding to your gardening book collection, we can heartily recommend Jane Brown's 'Gardens of a Golden Afternoon' which tells of the partnership of Edwin Lutyens and Gertrude Jekyll, two of the most influential garden makers of their time. Yes, a treasured collection indeed as so many of them hold personal memories. Gardens and writers we know and admire and recollections of some very special times and places. A remarkable lady and character, herself a product of a remarkable age and times. To have lived and socialised in such esteemed literary and poetic company during the hay days of the hard copy, book publishing industry, sounds like the stuff of fiction, but in Mary’s case, was anything but. The dusky period in our history when the reader was still allowed to become fully absorbed into his or hers selected piece of poetry or prose, without all the myriad of other life, technology and media distractions that threaten to reduce most of our future generations to little more than a scim read society, but without the essential levels of retention and betterment that would have been so enjoyed by Mary and many of her similarly, richly layered contemporaries’, from this gritty, yet truly decent and sophisticated era. So…now then Jane and Lance, having observed the size and scale of your library’s ‘gardening’ section there, a little poser for you…what sort of plants, herbs, vegetables or flowers, can I grow underneath my north west facing canopy of thirty foot high Leylandii Trees at the bottom of my garden…perleeese? Thank you so much for taking thetime and trouble to write such a detailed and thoughtful comment. We agree with you entirely, especially with regard to the 'skim read society', a phrase which we shall steal if we may? 2.Try any of these plants [success is not guaranteed] ............ Ajuga reptans, Arum italicum, Convallaria majalis, Euphorbia robbiae var. robbiae,Hedera helix[in variety],Hypericum calycinum, Lamium galeobdolon,Phalaris arundinacea 'picta', Vinca major. All of these would need to be started off well in good soil and kept well watered until established. Bonne chance!! Hello again Jane & Lance, and now that I have stopped laughing & chuckling out very, awfully loud over here, I am compelled to say in response to your first answer… ‘Perfect!’ – and…that’s the ‘right’ answer, which clearly wins you today’s round. No contest there then! I was chortling away to myself out in the kitchen while cooking supper a few moments ago, contemplating that if the roles were reversed, my answer to you would have been “Move!” Imagine my howl of joy then when I read your timely response just now?! Telepathic synergy in complete, comedic motion. Brilliant, and thank you for taking so much trouble with answer No 2. All that floralus latinus! Mighty impressive stuff this Jane & Lance, for which I will be Googleing Google all night long, out of respect for the efforts you have gone to here on my behalf. Funny, I posed the same question to a cheerful senior character at my local garden centre recently, and then watched as his open, friendly, attentive expression faded into a grey and melancholy...saaaggg, right in front of me. Then his inter staff radio device suddenly started chattering on his hip, and his face broke into a great big bright eyed, rapturous look of euphoria as he animatedly spoke right back to it saying ‘he’d be there in just a jiffy’ - and so I bade him good luck and farewell. Thanks again for the fun and the fauna ce soir. I am, and will remain, most happily in your debt. Salut! P.S. Steal the phrase part away with my full and humble blessings by the way. We’ll drink a quiet toast to Mary together, though afar, for the original inspiration of it, so to speak. Now we are the ones rolling around laughing! In the intervening moments between receiving your first and second comment, we treated ourselves to another look at your wonderful little film to which we sang along! This and your marvellously witty reply served to brighten up our otherwise rather dull evening in which we contemplated the horror of your hedge. Well I feel as if I have just met someone enchantingly full of humour and life itself, through your wonderful tribute to her. You were lucky indeed to have such a friendship, and all the warmth such a bond entails. What an interesting friend Mary must have been and what a beautiful tribute to her. You must think of her every time you pass your beautiful bookcase containing your gardening books. What a wonderful collection to have. If I'm ever in that area of London, I will surely check out the shop. I love to garden and have many friends that take it very seriously and have brought me along on many trips to nurseries and gardens in NY. P.S. I’ll be looking out for you (from my telly) in the crowds of this weekends Hungarian F1 GP, by the way (One of my many weaknesses. Ho hum). Please ask Jane to wear a big pink hat & sun brolly, and don’t forget to burgle me a small nugget of souvenir race track tarmac while they’re all distracted doing the champagne part at the end. Careful though, it will have become very gooey & sticky! Köszi! Thank you so much, Linda, for, as always, a very kind and generous comment. We have been most fortunate to have met and known, and still to know, some very interesting and talented people and Mary was most certainly one of them. Alas, the garden book collection overflows the one bookcase and is now to be found scattered throughout the apartment. Only recently we have had more shelves constructed so the book crisis, for the moment, is alleviated if not solved! What a very generous comment, Virginia. You too would have enjoyed Mary's company for she was as interested in interiors as she was in gardens, and her own house was delightful and full of very covetable things. Yes, the bookcase is, as you say, a permanent reminder of Mary and so many of our gardening books bring back happy memories. Your gardening friends are, we are sure, great fun but we do know how very seriously gardeners take their subject!! Now, we are very impressed, and increasingly suspicious(!! ), of all this Hungarian. Your 'Party Line' is that you are happily tucked up somewhere in the south-east of England, whereas we are beginning to think this is to throw us, and other readers, completely off the scent and you are, in fact, no less than a registered, all papers correct [identity card to prove it] Pesti!! Last night we slept soundly believing that the 'leylandii' were no more than a dream and that, in reality, they do not exist - their place taken by the trimmest of yew hedges. Horror of horrors to wake to discover that this is not so - they are there, in your garden, putting on, as we write, yet another couple of feet. This is a most sad and sorry truth. AS for the Grand Prix, no joy we are afraid. We shall be far too busy supping champagne to grovel in the dirt for pieces of melting tarmac - although the profits to be had are very tempting. Morning Jane & Lance - Ha ha ha! Close but only half the cigar. You’re warm, but you’ll have to get thoroughly wet and swim the Danube I’m afraid before you finally catch me! Cos I’m a ‘Buda’, a west bank boy…not a pesky ‘Pesti’ from the east river side. Then again…I may be none of the above of course. Just a charade from central southern Uk coastal region, dyed in the wool, part Irish, part Anglo Saxon, part ancestral French Huguenot, modern European ‘mere man’…who, only thanks to your wonderfully intriguing Hungarian showcase blog here, has found himself increasingly captivated by your adopted country’s cultural mystique, modern history, social divisions and aims for a better, balanced, future society at large. All thanks to you two great blogger people for lighting a bit of a fire under my goulashes…and an awful lot of help from Google and the www, believe me! Just discovered that for the needs of the 2005 film ‘Munich’, they disguised Budapest as Rome, Paris & London, amongst others. Work that one out. Cos I couldn’t ! See what you’ve done? (!!) Now there’s a fine learning curve you’ve gotten me into. Ah, the green hills of Buda and the clean air. But, not for us as it is also home to the majority of the Expat brigade, something we studiously avoid. And so we live amongst the crumbling stucco of Pest [could there be a market for that, we ask? ], the Terror House, a mere step away, and serving as a grim reminder of what happens to those who step too far out of line!! You are absolutely right about the film Munich and one of our favourite cafés, the Gerloczy, featured in the coffee house scenes. Indeed, filming is big business here as there are plenty of ruined houses and grime covered buildings here to add the right atmosphere and all the feeling of Paris from another century at a fraction of the cost. But, it is not all nostalgia as Budapest is also booming as a centre for the development of computer games. Damned clever, these Hungarians...just think of the Biro!! We are sad that you can play no longer and that the mines call. For us lazy tarts, it is our great good fortune to look forward to a day at leisure [no change there then]. Until we meet again, minden jót!! Hi Jane and Lance - what a beautiful tribute to a dear friend and what a wonderful and interesting life she had. I would so love to see some of those gardening books or perhaps even visit the shop one day. It is the little things that trigger thoughts of those that you love isn't it?! Even though you must still miss her so, your fond memories, I hope, give you cause to smile. We all join with you in regretting the loss of your delightful friend Mary, clearly someone who was much in tune with your deep interest in gardening. I look forward to seeing the Budapest party photograph, perhaps this time with a less mysterious view of dear Jane, in your much-anticipated Hattatt Guide to Dining Room Etiquette - I can only hope that you are serious about this and hereby sign up for three copies and a free crystal finger bowl. Yes, you are absolutely right. It is those small details that one recalls with such fondness since they made the person the character that they were. Perhaps in a future post we may investigate the gardening books further. Some of them really are wonderful and still have much to offer to gardeners today. It was in searching for a photograph of Mary that we came across the album created by another friend of our Silver Wedding party in Budapest. We had such a happy time looking through the images and this was the best one of Mary. We hate having our pictures taken but, of course, when an image of the authors of the 'Hattatt Guide to Dining Room Etiquette'[which we see running into several volumes] is required, we shall grit our teeth, smile and think of England. When that great day comes, as surely it will, we shall of course hope that the editor in chief of 'Blogging and the Philosophy of Food' on-line magazine will grant us an interview for the launch!! What a wonderful post in memory of Mary! Thank you, she was indeed wonderful and we regard it as an enormous privilege to have known her. Hello - how good to 'meet' you! Thanks very much for coming over and introducing yourselves - it is very good to have your comments and to come over and find you here. I am now following your blog and look forward to learning more from you! We are so delighted to welcome you as a Follower and look forward to developing a dialogue together. We are so pleased to have discovered your most eclectic and lively blog and are most intrigued to learn of your life in different countries. Your posts are such an interesting read. Coming in a bit late but so happy to have been able to read your tribute to Mary. What a full and fruitful life she lead. You are always most welcome and we are delighted to have your comment. Mary was, as you may imagine, a most interesting person and one who enriched the lives of others at all times. What a fascinating and enjoyable post Lance and Jane! Mary must have been a very talented and energetic lady, seems to have had a wonderfully interesting and stimulating life from what you have shared here, and is obviously sadly missed by you both. Thank you for sharing this, and I am so envious of your amazing collection of gardening books! Yes, Mary was indeed a strong woman, intelligent and self-reliant. Times were not easy for her when she had to raise her children alone. The gardening books really have reached library proportions now but, although we discuss pruning them, we never seem to have the heart or the will to do so. I know what you mean about the will to "prune" ones books - we have rather a lot all over the house and I think there are very few I could part with the exception maybe of a few novels that I have no urge to re-read. Certainly I could never part with even one non-fiction book, as I just know that within a few weeks that would be the very book I would be frantically searching for to check out a fact or read up about something! Also being an ex-Librarian it would go against the grain. Now we can readily understand your reluctance to be rid of any books. As a former librarian they must form a very great part of your life. And what you say about non fiction is so very true for we do, as clearly is the same with you, find ourselves constantly looking things up. In our case, though, it is remembering where to look! We are so impressed to know that you are a botanist but now very, very wary about making any pronouncements about plants and rather cringe to think that we have a published Encyclopedia of Garden Plants. Oh dear!! Thank you both for this lovely tribute to your friend. How wonderful to have a collection of books on that most iconic of artists, Georgia O'Keeffe. We are all for simplifying life but never at the expense of culling books. To us, these are essential to one's well-being and are so full of memories, ideas and inspiration. Dear Jane and Lance, what a lovely tribute. Certainly we have a very diverse range of gardening reading amongst our collection. Although we have considered selling them all as we no longer have a garden, there are too many memories contained within them and so they remain. It s true that the Small Gardens volume tends to appear less frequently than the other titles, but we have seen it on ebay from time to time. You might find it fun, and of course useful, we hope, to track down. A beautifully composed tribute to a dear friend. I am sure you cherish her memory dearly. She sounds quite a "gal" as my darling grandma loved to call interesting women. I have been in that bookshop! I am not a gardener at all, though I love the visual beauty of gardens & plants very much, but my brother is. Years & years ago, I was asked to pick up a particular, rare in Canada apparently, book on succulents for him at the shop, and take it back to Canada for him. You may be interested to know that my Hungarian grandfather, had a mail order business for seeds when he first immigrated to Canada in the early 20th century. A few of these catalogues still survive, and my brother cherishes the ones he has. Apparently my grandfather was a talented gardener and was well known for grafting(?) apple trees and such. Your collection of books must remind you fondly of the many discussions and dinner parties you had with your friend Mary. How extraordinary that you should have visited the bookshop on Kew Green and how wonderful to learn that there is, most obviously, a long gardening tradition in your family. We were most intrigued to know of your grandfather's seed business as well as his work with grafting [something which is highly skilled and which we most certainly never mastered] of fruit trees. It is good to know that your brother still has some of the original seed catalogues. Mary was an exceedingly good friend and we do miss her very much.